The FIB-SEM can build a 3D stack of data by cutting into the material using the added ion beam and acquiring high-resolution images with FEG SEM. 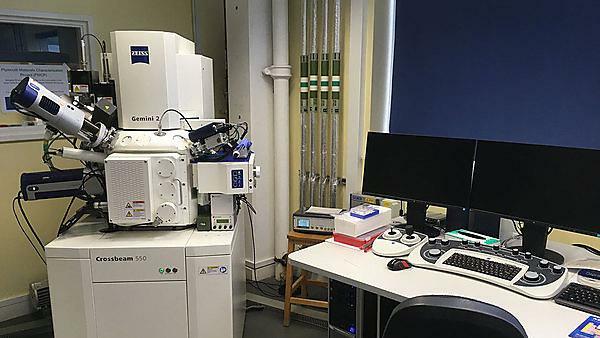 This latest Focused Ion Beam - Scanning Electron Microscope from Zeiss was acquired partly through ERDF funding, and was delivered to PEMC in February 2018. The whole installation and calibration process took two engineers for five days. Beside is a video clip showing how it was done. A column of a gallium ion source is added to a conventional SEM, which elaborates the so-called FIB-SEM. Together with GIS, the FIB-SEM evolves to the next stage where large volume 3D reconstruction of the sample with nano-scale resolution is available at hand.